Thumbprint is a contemporary opera-theatre work by playwright/librettist Susan Yankowitz and Indian-American composer Kamala Sankaram. Using a mix of Hindustani music and European opera, and a cast of six singing in a variety of classical Western and Asian vocal styles, Thumbprint is inspired by the experiences of Mukhtar Mai, a young illiterate peasant who was gang-raped as retribution for an alleged ‘honor’ crime by her little brother and who became the first woman in Pakistan to bring her rapists to justice. When offered a settlement, she instead asked for a school where girls in her village could be educated so that they, unlike her, would never know the humiliation of having to sign their names with a thumbprint. Despite government opposition and repeated death threats, she has now become an international voice for human rights. Mukhtar’s remarkable story is at the heart of this boundary-leaping work that embraces East and West, Indian ragas and world folk music, the classical and the contemporary, the styles and pleasures of both opera and music-theatre. While in residence at Watermill Center, Kamala and Susan will be revising and finalizing the libretto and score of Thumbprint. At the same time they will be exploring the piece on its feet with director Rachel Dickstein and a small cast of singers/actors as a first opportunity to work on the intersection of words, music, movement and character. Kamala Sankaram’s music has been praised as “strikingly original” (Allan Kozinn, NY Times), and performed as part of American Opera Projects “Opera Grows in Brooklyn” series, at HERE Arts Center, the Stone, the Bang on a Can Summer Festival, the Santa Fe New Music Festival, and the Lucerne Festival, among others. She had the featured commission on the 2009 21C Liederabend, selected as one of Time Out’s 10 Best Classical Concerts. Her music for SOUNDING (directed by Kristin Marting) was praised as “gorgeous pop-rock interludes” (Time Out NY). She was the 2011 Con Edison/Exploring the Metropolis Composer-in-Residence at the Brooklyn Youth Chorus Academy and the 2012 Composer-in-Residence at the Eugene O’Neil Theater. She has received grants from the MAP Fund, the Foundation for Contemporary Arts, Meet the Composer, and the Asian Women’s Giving Circle, as well as residencies from the MacDowell Colony and the Hermitage. 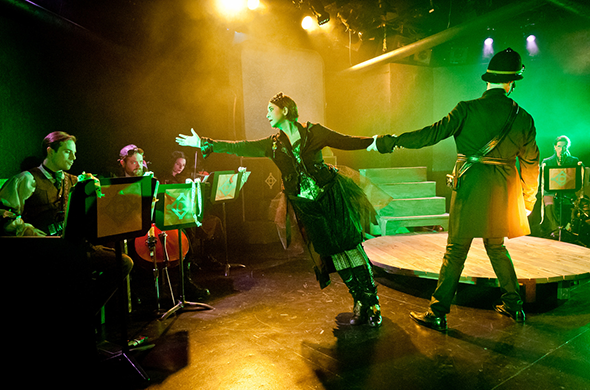 As a resident artist at HERE Arts Center, Kamala created MIRANDA, a steampunk murder mystery opera called “enjoyable, utterly original opera” (NY Post) and “among the very best theater achievements of 2012” (NYTheater.com). Susan Yankowitz is a playwright, novelist, librettist and occasional screenwriter. Among her best-known plays are NIGHT SKY (produced off-B’way and internationally); PHAEDRA IN DELIRIUM (produced at CSC and WPP, NY; winner, QRL poetic play competition); TERMINAL and 1969TERMINAL1996, collaborations with Joseph Chaikin’s Open Theatre (Drama Desk Award); and A KNIFE IN THE HEART (Sledgehammer Theatre). BOXES A-Z just won the 2012 award for Best Ensemble Play in Ankara, and her long monologue about Mukhtar Mai is in continual production in the U.S. and internationally, on its own and as part of SEVEN, most recently in India and Afghanistan. SILENT WITNESS, her novel, was published by Knopf and her teleplay about Sylvia Plath aired on PBS and won her a WGA nomination for best-written documentary of the season. She has collaborated on opera-theater works with Elmer Bernstein, Taj Mahal, Moshe Cotel, and Michael Dellaira, and has been awarded grants from the NEA, NYFA, TCG, and Guggenheim, McKnight, Bogliasco and Rockefeller Foundations, among others. She is a frequent resident at Yaddo and MacDowell. Her work is archived and catalogued at Kent State Library. Rachel Dickstein is a writer, director, teacher and founding Artistic Director of Ripe Time, a company devoted to creating movement based, ensemble devised adaptations. For the company, she choreographed and directed Septimus and Clarissa (Drama Desk and Drama League nominations) at the Baruch Performing Arts Center, for which she was nominated for a SDC Calloway Outstanding Directing award. Other Ripe Time projects include: Fire Throws at 3LD Art and Technology Center, Betrothed and Innocents at the Ohio Theatre, The Secret of Steep Ravines at P.S. 122, The Holy Mother of Hadley New York co-produced with New Georges at the Ohio Theatre, and The Palace at 4 A.M. at HERE Arts Center. Other projects include Vijay Iyer and Mike Ladd’s In What Language? at the Asia Society, REDCAT and PICA; and Ellen McLaughlin’s The Trojan Women at Purchase College. Rachel is under commission with People’s Light and Theatre to write and direct Sylvan Wood, in collaboration with Susan Zeeman Rogers, a site specific dance-theatre work to be staged at Longwood Gardens. She has served as Assistant Director to Martha Clarke on new opera works at Lincoln Center Festival, New York City Opera, the Munich Bienale, and the Hong Kong Arts Festival. Recipient of the NEA/TCG Director’s Fellowship researching and training with dance master I Ketut Kantor in Bali, Indonesia. She is also a former Drama League Fellow, a graduate of Yale College, and faculty member at Purchase College’s Conservatory of the Arts.